I confess – I have long had a rather complicated relationship with the idea of having help at home. I suppose it can all be traced back to my childhood in Pakistan. Growing up amidst a plethora of house help was the norm, for upper middle-class families such as ours. In addition to having a cook to cook meals for us, a maid to clean, a gardener to tend to the garden and a driver to drive us around town, there was even a ‘dhobi’ – a professional laundry man who washed and ironed all major clothing and bedding and hand delivered our clean laundry to us every Sunday on a donkey cart. Each time the doorbell would ring on a Saturday, my father would go out and let one of the house help in. During particularly uncertain and troubled times in our home city of Karachi, we even employed a security guard at our house for additional security. In many third world or developing countries with large numbers of unskilled labourers, hiring domestic help is not only affordable, but quite vital in creating jobs in the local economy and providing useful and gainful employment. Growing up watching my parents trying to manage their household staff (on a smaller scale than Downton Abbey with no Mr. Carsen as a butler), made me realize how stressful the entire setup was. Domestic help, while readily available in Pakistan, is also notoriously unreliable. A strike in the city might mean that the maid could not board her bus from one of Karachi’s slums to our posh locale in the upper middle class neighborhood we lived in. The driver might not show up for work one day because his father’s cousin’s wife just gave birth to his nephew. The cook, who had to undergo immense scrutiny of his method of preparing all his dishes from my grandmother who lived with us, would often quit citing her “interference” and “high standards”. I can’t remember the number of different cooks we had growing up in Pakistan. As a family, we joked and placed bets on who would last the longest! Every month entailed a new saga and sometimes a new cook. When the gardener refused to wash our cars, my father went and hired another person, whose sole responsibility was to wash and keep our cars cleaned in the dusty climate of Sindh. The driver didn’t appreciate the extra pair of hands demanding the car keys and one afternoon, it all went downhill pretty fast. I think we lost the gardener, the driver and the extra car washing guy in one fell swoop! Watching from my bedroom window, I concluded that having domestic help was definitely more of a hindrance than a help. That and the lack of privacy, was difficult to deal with, with people constantly going in and out of the house, upstairs and downstairs. I took these lofty ideals with me to the United States, when I arrived ready to start college, wholly unprepared for living on my own. It was embarrassing to admit to my American roommate that at the age of 19, I had never done laundry before – could she please show me how to operate a washing machine? Despite her help, my first few loads were a disaster – my white socks turned pink, thanks to the red T-shirt I had carelessly left in the pile and my clothes never dried fast enough in the harsh winters of Massachusetts, unlike the hot afternoons in Karachi. Growing up with domestic help was suddenly a big disadvantage for me. I wanted to claim my independence and learn how to do everything myself. I vowed never ever to be dependent on household help again, and to learn to do all household chores myself. I started valuing my privacy and alone time and could finally appreciate the satisfaction that came from doing it all by myself. Fast forward many years of living abroad in the United States, the United Kingdom, Germany and Denmark. I thrived in such Western societies, where the notion of employing domestic household help was not the norm or the standard. It fit my new ideals of being self-reliant. My German mother-in-law who worked full time, did employ a cleaner who came once a week to thoroughly clean their house in Germany, but she was efficient, punctual and reliable as probably only a German cleaning lady could be! A far cry from the domestic help I was used to. The societal pressure to hire help started when I left Copenhagen, 5 months pregnant and arrived in Singapore for our next expat assignment. It was my first time moving to a country where hiring a full-time live-in maid or a helper was the norm for many expat families such as ours. The first few months in Singapore, I went from one expat meetup to another, to chatting with my local landlady – a Malaysian Chinese woman – everyone insisted that I would need help once the baby arrived. It was not so difficult to explain why I was so vehemently opposed to having a full-time helper. I had just quit my job and offered my resignation in Denmark at the oil trading company I was working with. I was now pregnant with our first child and had just moved continents to focus on being a stay at home mother. The thought terrified me, but since I was already grappling with an immense loss of identity stemming from giving up my career, how could I possibly give up my household duties and outsource them to someone else too? What would there be left for me to do then? So while I understood that many expat families in Singapore made use of the local availability of help, while living far away from their friends and family back home, I knew it just wasn’t for me. For many expats, especially those from the West, having hired help at home was a novelty. A luxury to be enjoyed that came as a perk of being posted to South East Asia. For me it was something I had grown up with. A hindrance. A headache to be managed. And I just didn’t want any of that. Years of doing everything myself meant that I struggled to relinquish control over my house to anyone. Just the thought of giving control of my kitchen to a helper was too stressful for my type A, OCD personality to handle. My German-Italian husband also unused to help, agreed and so it was settled. Of course, each time, I complained to my parents on the phone that I was sleep deprived (hardly surprising with a newborn), my father would insist the solution was to “hire help.” The more everyone told me I needed help, the more I made up my mind that I did not need help! I thought admitting that I needed help would be admitting that I was failing in my new role as an expat mother. After all, so many mothers in different countries did it all themselves and I didn’t hear them complaining. It took many years of motherhood since then to make me realize that as a mother raising your kids abroad, without “your village”, any help you can get is vital. I slowly stopped judging kids who would arrive at a playground with their maid and tried to imagine what the mother was doing at home. Maybe she was helping an older child with her homework? Maybe she was cooking dinner and had asked the maid to take her child for some outdoor play in the meantime? Over time I grew less judgemental and more accepting of the notion of having household help as far as others were concerned. But I was still hesitant to try it out myself. When I arrived in Dubai with a 2-year-old toddler and pregnant with my second baby in a high-risk pregnancy, in the scorching Arabian summer – I took one look at our villa and decided that yes it would be helpful to have some help cleaning this house, especially given the dust blowing in from the desert every day. 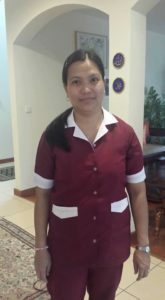 I knew I was still not ready to have a full-time live-in maid as was also the norm in Dubai, but I dallied with the notion of hiring part time help. I agreed with my husband to try one of the agencies a friend had recommended for hiring a maid to come to your place for four hours and clean and then go back. The first two maids the agency sent were a disaster. I was just about to give up when they sent Maryann over to our villa one afternoon. Hailing from the Philippines, there was something about her right away. 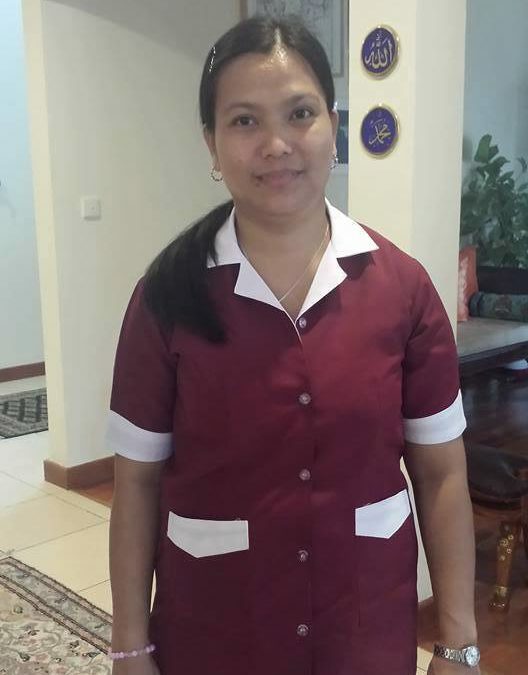 She was fast, efficient, organized, superb at cleaning and was excellent at taking the initiative herself. It was official. My part time helper/maid Maryann was excellent. Thanks to her my household was cleaner and more organized than ever before. Soon, she was the one giving me cleaning tips on how to get rough stains out. I happily surrendered. Not my whole household but a part of it – the cleaning, organizing and ironing part. I still cook, look after the kids and do everything else, but having Maryann around has made my life a whole lot easier as a working mother of two. The best part is that she doesn’t live with us and is not always in my space – so I have some help without sacrificing my privacy or my sanity. In the past two years, Maryanne has become almost like family. As soon as the doorbell rings in the afternoon, my kids run screaming to the door “Maryann is here!” She has babysat for us a number of times and done a great job each time and the kids love her. But as most expat stories go – this one too ends with a repatriation. Except it is Maryann who is repatriating back to the Philippines, not us. Her husband and two sons await her arrival back home. Expat life in Dubai has been tough; to be away from her kids has not been easy. While she has attended all of my children’s birthdays, she has missed her own children’s birthdays. After earning and saving some money, Maryann will return home at the end of the summer. When she told me last month, I started to cry. Not because I was losing the most valuable help I have had in my motherhood journey abroad, but because she ended up teaching me my most important lesson yet –someone who may come to clean your house twice a week, could end up becoming part of your support network away from home. And that’s a good thing. We don’t need to do it alone. We need all the help and support we can get, when we raise our families away from home. We expat mama’s have to stick together. May we all be lucky enough to have a Maryann in our lives. Author’s Note: My family and I are planning a little farewell surprise for Maryann next month. She will be greatly missed and hard to replace. Through the years she has worked for us, we have tried to help her financially and offer support for her family when she’s needed it. We will keep in touch and hope our paths may cross again someday. Thank you for valuing Maryanne and treating her like family. I read about so many of my countymen being mistreated when they work as helpers in other countries and it breaks my heart. The way you wrote about Maryanne in such a loving, positive light is beautiful. Thank you Ayla! So lovely to read your comment. Maryann has been a true blessing for us, we are sad to see her go, but very excited for her to be reunited with her family in the Philippines. I really enjoyed reading this! Sounds like you struck gold with Maryann. So special to be able to feel so comfortable with someone in your home and for her to become a true friend. I’m sure it will be so hard for you guys her leaving but at least it is a happy ending for her! Do you think you will try to find someone else to help you once she has gone? Thanks so much! So happy to hear you enjoyed the read. And yes we certainly struck gold with Maryann. Her leaving is tough on us, but I am also so happy she gets to be reunited with her family back in the Philippines. Since our experience with her has been so positive, it did help me shake a lot of my previous notions of hiring help and be more open and willing in the future. Thank you Naz, lovely to hear that this post resonated with you! And thank you for your lovely wishes for Maryann – she is back in her home country and very happy to be with her family. We stay in touch through Whatsapp 🙂 Its lovely when a part-time helper becomes part of the family, I hope you can continue your special relationship with Princess too. I found your blog through the ‘Time Out’ nominations page and I’m so glad I did 🙂 This post and the other one about kids moving internationally, truly resonated with me. We have just moved to Dubai from India, with three kids (10,4, 2 mo) in tow. And it has been toughest for my 10 yo. And as for the help part – yes, I also was like you after my first child. In fact we had just repatriated from Switzerland back to India with my then 1 yo and everyone around me was astounded that I did not have any help. I managed with minimal help for almost 6 years till my second one arrived – after which I just decided that I needed all the help that I could afford. And that was the best decision that I made. Even though there were instances when I was not happy with the people who I hired – we ended up with a wonderful helper who made life so much easier for me – and made me a much happier parent too! You see, when I was doing everything on my own I used to be too exhausted and cranky to enjoy my baby (something that I still feel guilty about)..
Hi Nidhi, lovely to hear that this article resonated with you and welcome to the blog! 🙂 Hope you are settling in well in Dubai. I can completely relate to your experiences too, sometimes we are so afraid to ask for help or admit that we need help. But if living abroad teaches us one thing, its that we need to create our own tribes and support circles to feel supported in the absence of close family.